In this area of specialization, the student will focus on the role of livestock in sustainable development. Students will develop an expertise in livestock production in the developing world, including agro-ecosystems, production systems, indigenous species, trends in production, and the appropriate development and application of tools for improved production, including genetics and technologies. In this area of specialization, students will focus on interdisciplinary research leading to an understanding of the ecological context of diseases, particularly emerging and re-emerging diseases, multi-species diseases, and those diseases threatening the survival of species. In this area of specialization, students will focus on the role that veterinarians play in protecting public health, particularly in controlling diseases related to livestock-derived food production and consumption that are prevalent in the developing world, such as brucellosis, tuberculosis, cysticercosis, cryptosporidiosis, rabies, and salmonellosis. 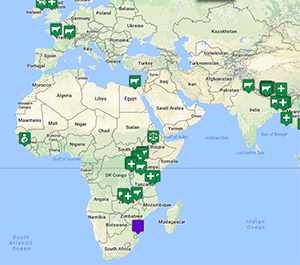 In this area of specialization, students will focus on the evolving role of livestock and livestock services in conflict situations, concentrating on the appropriate provision of humanitarian assistance to livestock keepers in crises such as humanitarian emergencies, chronic environmental instability, and situations of chronic conflict and political instability. In this area of specialization, students will develop an appreciation of social, cultural, and economic issues related to animal health and production. Students will gain an understanding of and basic expertise with relevant socio-economic tools.